Again. I apparently like naming my images black and white. I also like taking fewish snaps and abusing them to the fullest. You know you want to click me. Update: Worked with a 5-10 colour indexed mode image to get a very small gif. Rethresholded it to different values to get more detail. I am new to indexed images. They are a lot more restrictive than the usual ARGB. GIF *shudder*. In other news, been helping out a bit on mmmaybe.gimp.org. Menial stuff for now, but someone’s got to do it. Perhaps I could interest you in a related entry: Black, or white?, Black and white hats. This is a printer-friendly version of the journal entry “Black and White” from actuality.log. Visit https://emphaticallystatic.org/earlier/black-and-white/ to read the original entry and follow any responses to it. : ) i did a similar series too …. though with my face plastered down on the scanner. we could be twins, me thinks! We could be :). Beginning to love your new set too. Sharp contrast with the peacefulness of paper and the sorts of textures you’d introduced earlier. Curious though. Didn’t you cut/scrape/hurt yourself handling those rather jagged looking shards? I’d say something along the lines of be careful but I guess you know that. I noticed we do things differently. (Yes, I in a less creative way.) I take things that exist and then modify the pictures to what I want to express. Not the other way around. I’m lazy. This picture is quite hmm.. cheesy is the word. I was doing a lot of things with this. Primarily mocking *cough*, a rather famous person. 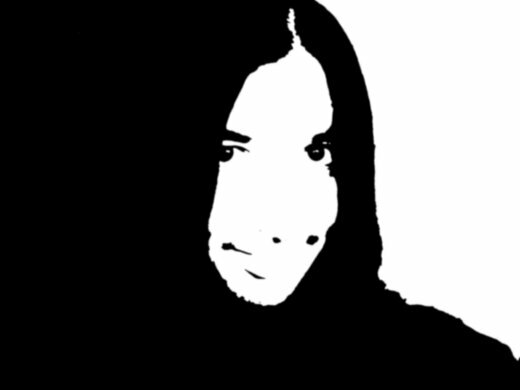 Black and white – black or white – noseless – mr. i’m black yet i’m white and I have an odd preference for kids. Lol, and I’m sure you seeing Irreversible has nothing to do with that opinion and outlook. How’s Irreversible? heard a lot about it. I doubt it’ll hit the dvd rentals here. I don’t think I’m very creative . its more of a obsessive-compulsive thingy (I did that test too)! And for the record, I like the way you cover different grounds in photography. I’ve more of this one-track mind which is very boring. Really. And the black and white Mr. Jackass – now I get it !